High necks remind me of my childhood days when my mom used to get one for me in every possible colour. Since then it has been my beloved classic! I am coming up with a wedding series next week onwards. Stay connected. Till then see ya! This post is about the pant-suit trend that made a major comeback this year. A sleek, streamlined suit will never disappoint you. You've got to be sure about the fabric quality & the fit (unless you are going for a boyfriend blazer). 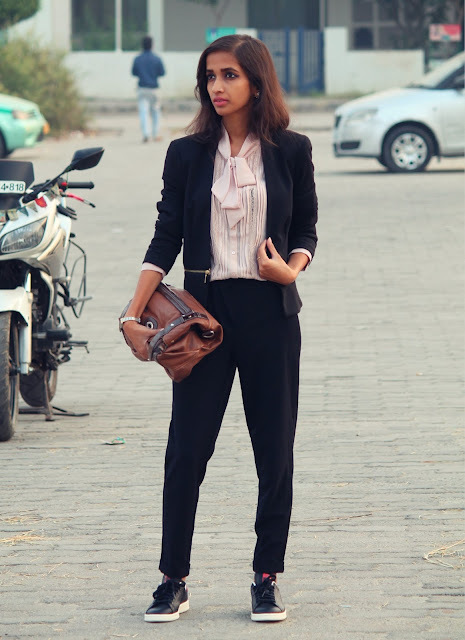 I layered a self-tie blouse underneath the blazer which gave a perfect contrast to the attire. Pairing sneakers with formal clothes injects an unexpected twist to the basic silhouettes. To break the formality of the suit, I wore a pair of sneakers. If done right it makes the outfit looks cool and edgy, but make sure you don't over do it. Opt for rather simple sneakers! Added an oversized clutch & minimal accessories in silver tone. 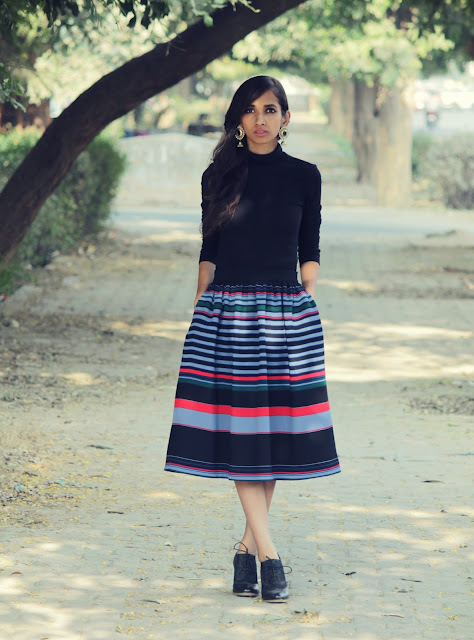 Despite the bitter temperature and lack of Vitamin D, the one thing you can smile about in winters is your wardrobe expertise. 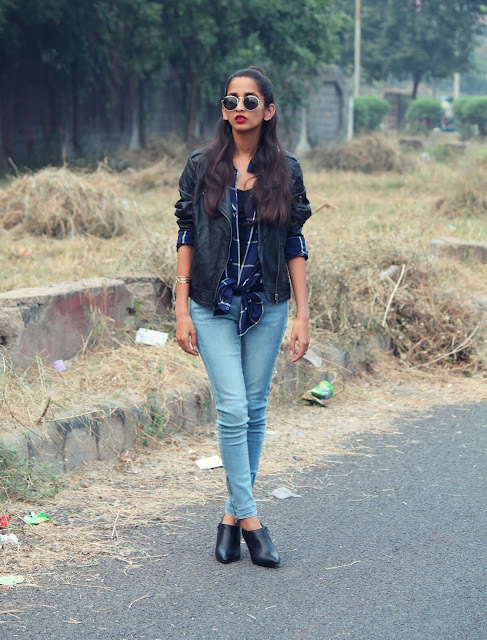 I am starting my winter dressing in a rough mode, with deep tones & a hairstyle incarnation! Remixed leather (read: faux) and denim to create a rough & tough aesthetic while still keeping it sophisticated. Wore an unbuttoned (with a knot) shirt over a camisole & layered the former with a faux leather jacket. Rolled up the sleeves to add these dainty stacked bracelets. Do share your feedback. Much love! I'll start with wishing *Happy Diwali* to you all! Whenever we talk about Indian festivals, the outfits that strikes us first are lehenga, anarkali or may be a saree. Quite clichéd, I believe! So this year, I decided to stand out from the crowd & took the 'less is more' way. I picked this lehenga during my short trip to Jaipur long time back, only to never think of how & when to wear it. 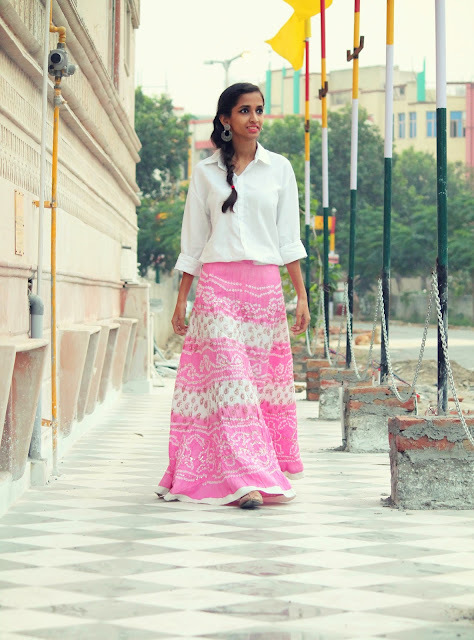 Created a fusion look by pairing this Bandhani skirt with my staple white shirt, which according me did full justice to the festive season while being on a lighter side. Added some oxidised drama to the whole attire with these chunky anklets, and combined two of my earrings to create these gorgeous pair of chandbalis. Finally, slipped into these traditional juttis to complete the look. Summer is on it's last leg, days are still pretty warm & I am not missing any chance to wear a dress without weighing down under those heavy winter layers! When it comes to denim, one always prefer to stick to their tried & tested denim shorts, jeans or may be, dungarees! But in my case, I choose go for transitional pieces. May be this the reason why I bought this uber cool denim shirt dress.